There are many options available to today’s marketers. Being able to efficiently and successfully reach your target audience is extremely important. One area that we don’t talk about too often is trucking fleets. We speak frequently about how fleets can reach their audience . . . prospective drivers. There are also entire industries who cater to the fleets themselves. Dealers, parts manufacturers, and trucking tech companies to name a few. These companies must know how to reach fleets in order to deliver their message. So, how can they do it? Social media, email newsletters, and even traditional print ads are all viable options. Recent findings, however, seem to indicate that the most effective strategy may not be any of these . . . or more to the point, any one of these alone. Embracing a multi-channel campaign that spans print, digital magazines/newsletters, and social media all working in conjunction with one another could be the best path available to help companies target reach the fleets they desire. Taking advantage of employing performance marketing is a great way to monitor, adjust, and optimize your efforts. According to our case study, The Power of Print in a Multi-Channel Campaign to Reach Trucking Fleets, traditional print could lead to boosting your digital as well as overall conversion rates. Let’s take a look at why this multi-channel approach could be the most effective strategy moving forward. The world has changed quite a bit over the last two decades. In 1995, only 3% American homes were online. Traditional means such as print advertising were the obvious way to go. However, as the internet has grown and technology has creeped into our everyday lives to a point few could have predicted 20 years ago, print remains a viable option. In fact, when those surveyed for the 2016 CCJ Connectivity Study were asked if they could receive industry from only one source, what would it be? Print was the the favored source with 44.6% of responders preferring it to any other method. Why is that? With so much available online and so many people now using the internet daily, how is that possible? There could be several factors such as the age of the current work force. The older generations did not grow up with the technology or take to it as quickly as some in the younger generations have. Another factor could come down to neuroscience. A 2015 study by Temple University Fox Center for Neural Decision Making took a look at how people responded to physical and digital advertising. They discovered that respondents spent more time on print ads, print ads yielded higher levels of recall, and the physical ads caused increased activity in the area of the brain associated with value and desire. To learn more about the science of print ads you can check out, Advertising Science – The Power of Print. Obviously print was much more dominant years ago, and we may see it’s popularity decline as younger generations enter the workforce in the coming years. Make no mistake, print can still be a valuable tool. But companies can’t rely on print solely. What about digital? As pointed out earlier, the number of internet users was minuscule in 1995. As of 2016 over 88% of the U.S. population is online. That gives companies a lot of opportunities to target and reach the fleets they desire. In the same 2016 CCJ Connectivity Study referenced earlier, 24% chose digital magazines as their preferred source of information, 17.9% went with the email newsletters, and 1.8% preferred social media. There’s clearly an audience for both print and digital, however, digital does offer more freedom and control over campaigns and allows marketers to modify their approach based on performance quickly and easily. Using targeting features on social media such as Facebook it’s possible to pinpoint a very precise audience and nurture them along in the process. This is opposed to the old “spray and pray” method of print, where marketers try to get messaging in front of as many people as possible and hope that some are receptive. This more refined approach with digital affords companies an opportunity to effectively target and know exactly who they are reaching. But the ultimate goal is to be able to reach people across every medium through multiple channels. So, can print and digital work together? Using print and digital together. The thing about successful marketing is that it can never be stagnant. Companies have to be aware of what’s happening and be willing to change their approach based on what is or what is not working. We have seen that the combination of print and digital can lead to the most dividends. Oddly enough it appears that print actually boosts and drives the success rate of digital. 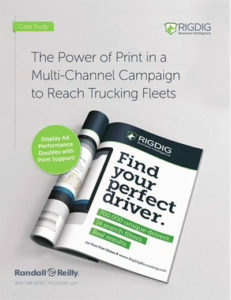 The case study, The Power of Print in a Multi-Channel Campaign to Reach Trucking Fleets, reveals how using both print and digital can lead to increased results. In the study print, newsletter, and display ads were used in addition to following up with Facebook and targeted emails. What were the finding? Print helped drive hundreds of demo request, slideshows, and brochure downloads. The landing pages saw a nice bump in conversions as well. In addition, Ad Display conversion rates doubled when the magazines were delivered. It’s clear that both print and digital are great options for pursuing fleets. Using a multi-channel approach incorporating both methods can not only lead to increased results, but actually end up feeding into one another. Need help getting started with a multi-channel campaign? Now that you know how a combination of print and digital can lead to the best results, what should you do next? Using data available from RigDig can help formulate a target audience and the performance marketing team at Randall-Reilly can help tweak and hone your approach to get the most out of your campaigns and minimize wasted spend.